Q4OS Linux 2.7 Live CD (64-Bit) | Linux DVD Shop - UK Linux Shop supplying Linux on CD, DVD and USB with Free UK Delivery, 24Hr Dispatch. 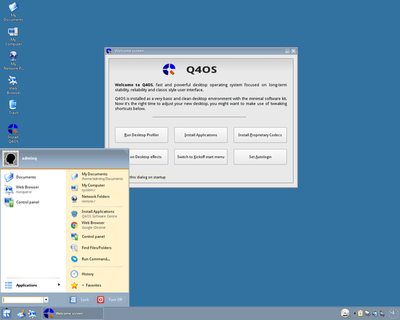 Q4OS Live for 64-bit computers is a Debian based Linux operating system aimed at new Linux users and previous Windows 7/10 users. It is a fast and powerful operating system that can be run live or fully installed and is based on the latest technologies while offering highly productive desktop environment. Its lightweight design allows it to run on nearly any hardware configuration and comes with a Windows XP look and feel.